Top of the Line Safety and Bathing Support The Drive Medical Bath Bench with Back and Arms is the ultimate in mobility self-empowerment. As a user, you are guaranteed your bathing experience will be one that is safe, carefree and pleasant.Built for individuals who require additional safety measures that assist you with mobility and balance while entering and exiting the bath or shower, this state of the art seat has been designed to comfortably accommodate all shapes and sizes.The lightweight design comes with large stable legs which are complimented by soft non-slip feet, ensuring your safety at all times. It also comes with tool free height adjustment. 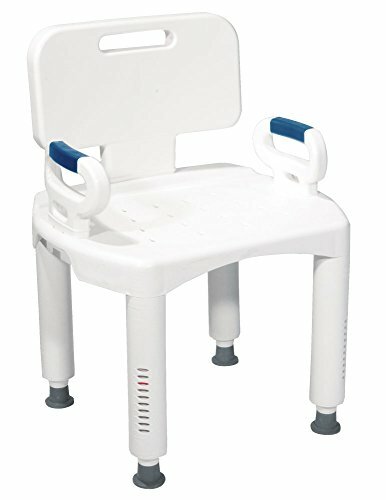 The back, as well as the legs and arms can also be removed as well, making it an item that is flexible, easy to store, pack away and transport.Designed to give you maximum comfort, efficiency, safety, and ease of use, the Drive Safety Shower Chair is strong, durable and dependable. It's everything you need in a shower safety bench seat.If you experience dizziness, or you're unsure of your footing due to mobility issues when it comes time to bathe...You can now help rid yourself of this stress and worry as bathing once again becomes relaxing and pleasurable, thanks to Drive Medical's Bathroom Safety Shower Tub Bench Chair with Back. Go ahead...Experience the Drive Difference Now!